This instalment of our Growth to Watch For series brings us on an over 13.5 km path through some of the fastest-growing areas in Midtown Toronto, covering roughly five dozen projects across 6.5 km². Our route will take us west from Bayview Avenue through the side streets of the Mt Pleasant East neighbourhood, east on Eglinton before zigzagging through the streets to the north, then west through the Allenby and Forest Hill neighbourhoods, and finally south on Yonge all the way to Summerhill. Along the way, we'll update the status of the projects working through the planning, approvals, and appeals processes, as well as highlight the many projects already under construction. Picking up where we left off last week on Bayview, we head west on Hillsdale to Mount Pleasant, then turn north. On the northwest corner at Soudan, we come to the first project in this instalment, a proposed expansion to the Briton House retirement community at 700 Mount Pleasant. The 25-storey, Julian Jacobs Architects-designed addition was submitted to the City for rezoning in November 2017, and is currently under review. Turning west on Soudan, a few doors along on the north side is where The Benvenuto Group's redevelopment proposal for 71 Redpath underwent significant changes in 2017. Previously proposed as 25 and 20-storey rental towers, the plan was scaled back in a resubmission for a single 24-storey tower rising from a three-storey podium, reaching a height of 78.75 m / 258 ft. The revised plan has been appealed to the Ontario Municipal Board (OMB) with a hearing date scheduled for May 7, 2018. One block west at 11 Lillian Street, the Lash Group of Companies' Distinction Condos began construction in 2017. The previous single-family homes onsite have been demolished, and shoring is now underway for the 19-storey tower designed by Giannone Petricone Associates. Excavation for the project's four-level underground garage will follow the shoring, with the construction of the 159-unit development set to continue throughout 2018. Just across Lillian street to the west, a tower-in-the-park infill project by Shiplake and Collecdev started construction at 45 Dunfield Avenue last year. Known as Lillian Park, the project designed by Kohn Shnier Architects with SMV Architects and Rafael + Bigauskas Architects consists of 26 and 28-storey purpose-built rental towers. Shoring and excavation were carried out into late 2017, and forming is now well underway for the towers' shared underground garage. Construction at Lillian Park will continue throughout 2018, and into the new year. Another block to the west, a Tower-in-the-Park site between Dunflield and Holly, still on the north side of Soudan, is slated for intensification. The Quadrangle-designed Plaza Midtown dates back to a 2013 proposal, and has been gradually evolving in the years since. Multiple Site Plan Approval (SPA) resubmissions followed the initial rezoning application, with the most recent version submitted last month. 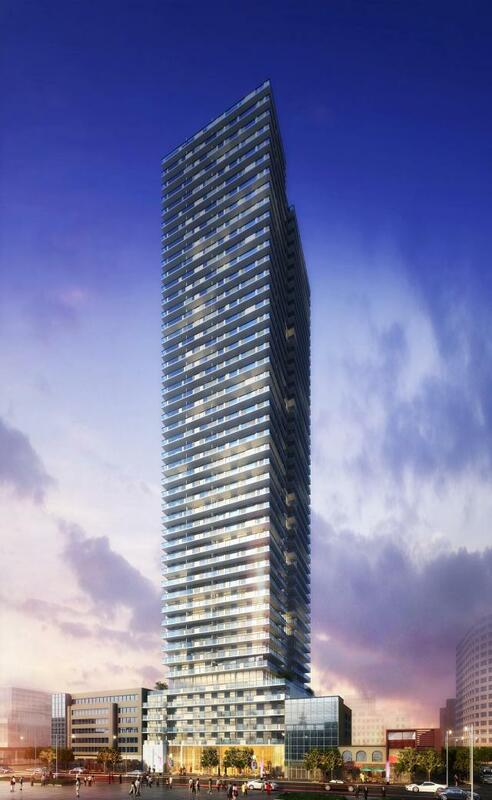 The planned 27 and 34-storey condominium towers with heights of 83.8 and 108.15 metres were appealed to OMB in 2017, and the next hearing is scheduled to take place on the 20th of this month. Heading north on Holly Street up to Eglinton, we turn east. Soon on the right, State Building Group's 55 Eglinton East was rejected by City Council before being appealed to the OMB in 2017. A settlement has since been reached for the Kirkor Architects-designed condominium tower, which is now planned to reach a 50-storey, 177.9-metre height. As part of the settlement, the newest version incorporates over 6,000 m² of office space, essentially matching the amount of office space in the existing 8-storey building that will be demolished to make way for the project. On the north side of Eglinton east of Dunfield, Madison Homes is planning to replace an existing 10-storey office building at 150 Eglinton East. Originally submitted for rezoning in 2015 as a 39-storey condominium tower designed by Quadrangle, the proposal was resubmitted in late 2017 with a series of changes. Now seeking a height of 46 storeys and 167 metres, the current plan would replace 100% of the existing office space on site, and include 429 condominium units. Continuing east on Eglinton to Redpath, Menkes Developments' The Eglinton is currently well under construction. The Giannone Petricone Associates-designed tower at 161 Eglinton East has progressed quite a bit since last year's Growth To Watch For, when work was just beginning for the tower's ground level. Forming is now over two thirds complete, and cladding has begun to enclose the building's lower levels. The tower is anticipated to top out at 33 storeys within a few months, with cladding installation and interior finishing expected to continue throughout 2018. Another block to the east, construction continues on the two plots of land that will eventually house the east and west entrances to Mount Pleasant Station on the Crosstown LRT. Activity on the main entrance building at the northwest corner of Mount Pleasant and Eglinton, and at the secondary entrance to the east on Eglinton, will continue long-term: the line's opening is targeted for 2021. Just steps north of the future Crosstown station, plans are in the works to redevelop the 10-storey Best Western Roehampton Hotel & Suites at 808 Mt. Pleasant Road. In late 2017, Streetwise Capital applied for Zoning Bylaw Amendments (ZBA) to permit a 44-storey Sweeny &Co Architects-designed condominium tower with a height 143.8 metres, containing 457 condominium units. A staff report from the City Planning department was released in January, identifying significant concerns with the proposed development, and stating that the plan is premature and not acceptable in its current form. A community consultation meeting is expected to be announced in the near future. Doubling back south to Eglinton and continuing east a few blocks brings us to the site of Sierra Building Group's The Cardiff at 492 Eglinton East, named for its position on the northeast corner at Cardiff Road. The 2016 proposal sought Official Plan Amendments (OPA), ZBA, and Site Plan Approval (SPA) for a 10-storey condo building designed by RAW to replace a group of single-family homes. An appeal to the OMB resulted in a settlement hearing in November, 2017, where a revised plan was presented seeking 12 storeys, a height of 38.6 metres to the top of the mechanical penthouse level, and 98 condominium units. The outcome of the settlement hearing has not yet been published. Meanwhile, registration for the project is underway. Turning north on Cardiff, we continue north one block to Roehampton Avenue before turning back to the west and moving back across Mount Pleasant. One block west of Mount Pleasant, construction is wrapping up at Freed and Capital Developments' 155 Redpath Condominiums on the southeast corner of Roehampton and Redpath Avenue. Finishing touches are nearly complete for the 34-storey tower designed by architectsAlliance, and residents have begun to occupy the building's 446 suites. Directly west across the street to the west, construction continues for 150 Redpath Condominiums, 155 Redpath's taller sibling. Once again from the team of Freed, Capital Developments, and architectsAlliance, the 38-storey tower will be under construction throughout 2018, eventually adding another 543 condominium units to Roehampton Avenue. Continuing west on Roehampton, we reach another Tower-in-the-Park-style development slated for intensification. A 38-storey Quadrangle-designed rental tower is being planned at 89 Roehampton Avenue, to rise adjacent to an existing 130-unit tower. Originally submitted by Pabs Corporation and Roehampton Apartments Ltd, TAS is now driving the proposal for the 236-unit building. Appealed to the OMB, it was approved in principle in late 2017. Roughly 100 metres to the west, Metropia and Capital Developments submitted a proposal in 2016 to replace an existing 8-storey condo at 39-41 Roehampton Avenue. Dubbed E2 at E Place, the plan calls for a 48-storey tower designed by TACT Architecture containing 617 new condo units, and fronted by a new Privately Owned Publicly accessible Space (POPS) that leads to a new connection to Eglinton subway station. The plan was resubmitted last year and appealed to the OMB. A May 10th prehearing has been scheduled. We now cut through North Toronto Collegiate's grounds to Broadway Avenue, and turn east. Times Group Corporation's proposal to replace two 4-storey rental apartment buildings at 55 Broadway was settled at the OMB in 2017. Previously planned as a pair of 45-storey towers designed by Wallman Architects, the scaled back and ow approved plan calls for 39-storey towers rising from a shared four-storey podium. Across the street, a proposal to intensify 50 Broadway Avenue was submitted by developer Frastell Property Management Inc. in mid-2017. The 12-storey Martin Simmons Architects-designed development would build on a surface parking lot site that currently serves a Tower-in-the-Park-style rental building that fronts onto Erskine Avenue to the north. The application for ZBA and SPA is currently under review by City staff. Immediately east of 50 Broadway, another Tower-in-the-Park intensification project is working its way through the planning and approvals process. Beaux Properties International's plan for 66 Broadway would see two storeys added to the top of the existing 20-storey rental tower on site, as well as the construction of a new stacked townhouse block. The CS&P Architects-designed project was resubmitted for ZBA in late 2017 with a series of minor revisions, and is currently under review by City staff. Continuing east but on the south side again, a 2017 proposal from Timbercreek Communities sought ZBA for a 40-storey, 402-unit WZMH Architects-designed rental tower at 75 Broadway Avenue. The project was appealed to the OMB in 2017, and an early 2018 resubmission introduced a number of changes. Now planned at 38 storeys with a faceted tower massing, the unit count has been reduced to 336. No OMB hearing dates have yet been posted for the project. A few doors over, a proposal by the Pemberton Group for 85-91 Broadway—at the southwest corner with Redpath Avenue—has changed quite a bit since its initial 2015 proposal. The Graziani + Corazza Architects-designed Broadway + Redpath was recently settled at the OMB with a 37-storey height. Construction permits have been filed for, meaning that we may see activity for the site begin this year. The intersection's southeast corner is already an active construction site, with excavation now complete and forming underway for Pemberton Group's CityLights on Broadway development. The project at at 95 Broadway Avenue will add a pair of 34-storey condominium towers designed by Wallman Architects, in an unconventional configuration wrapping around a holdout single-family home right at the corner. (It can be seen at left in the photo below.) Construction here will continue through 2018 and beyond. On the same intersection's northeast corner, another project was recently greenlit at the OMB pending tying up a few loose ends. The IBI Group-designed 223 Redpath/100 Broadway will rise 34 storeys and contain 329 new residential units, including 52 rental units to replace the existing 10-storey rental building currently occupying the site. Directly east of 223 Redpath/100 Broadway, Reserve Properties and Westdale Properties proposed a pair of Graziani + Corazza Architects-designed residential towers at 110 Broadway last year with an August 2017 rezoning application. The plan for the 28 and 35-storey towers—containing both rental and condominium units—has since been appealed to the OMB, where it will have a prehearing on July 31st. Yet another project is on the table for the growing Redpath and Broadway cluster, this one proposed at 117-127 Broadway Avenue. The IBI Group-designed project was previously proposed with heights of 34 and 35 storeys, connected via a podium of 5 and 7 storeys, as well as a 16-storey bridge building. The most recent plan sees towers of 35 and 36 storeys now, with respective heights of 110.0 and 112.8 metres. An appeal to the OMB in 2017 resulted in a November hearing, though the results of this hearing have not yet been made available. Reaching Mount Pleasant Road, we turn north, and then east almost immediately at Elvina Gardens. A 2016 proposal at #14 seeks to add 10 townhouse units designed by Keith Loffler McAlpine Architects to an existing low-rise community. It was appealed to the OMB in 2017, and had a prehearing back in October. A full hearing has been scheduled for July 9th of this year, where the fate of the project should be determined. Following Elvina Gardens where it turns north to Erskine Avenue, we turn west again and cross Mount Pleasant Road before arriving at the site of 101 Erskine Condos. Construction of the 32-storey 421-unit condominium tower and townhome development by Tridel and Beaux Properties International is now wrapping up just west of Redpath Avenue. Installation of finishing touches for the CS&P Architects-designed project will wrap up this year, followed by the start of occupancy. Further to the west on Erskine, just shy of Yonge Street, KG Group's 18-30 Erskine Avenue was approved for rezoning at the OMB in 2016, and has since started construction. Excavation is now well underway for the 35-storey rental tower designed by Kirkor Architects, and work will be ongoing here throughout the year. Upon completion, the project will bring 315 new rental apartments to the neighbourhood. Crossing Yonge Street, we continue west onto Roselawn Avenue. Past Duplex Avenue, UrbanQuest Inc. received approvals for their Rose Club project at 117-129 Roselawn last year, and the Drew Mandel Architect-designed project is currently in sales. Offering just 12 townhome units, the three-storey development has the potential to begin construction this year. Following the primarily residential Roselawn Avenue roughly 1.75 kilometres to the west, we arrive at the intersection with Chaplin Crescent. Here, a 2015-approved proposal at 515 Chaplin Crescent was resubmitted for SPA in June 2017. The plan seeks to intensify a site occupied by two 8 storey residential apartment buildings with a new 13-storey Kirkor-designed addition to the south building. 18 existing rental units would be demolished and replaced in the addition, while an additional 69 rental units would be created. Heading southeast along Chaplin Crescent, we cross Eglinton where work is underway on Chaplin Crosstown Station, and continue towards Avenue Road. At 145 Chaplin, a 2016 application for ZBA and SPA has seen 2017 and 2018 resubmissions. 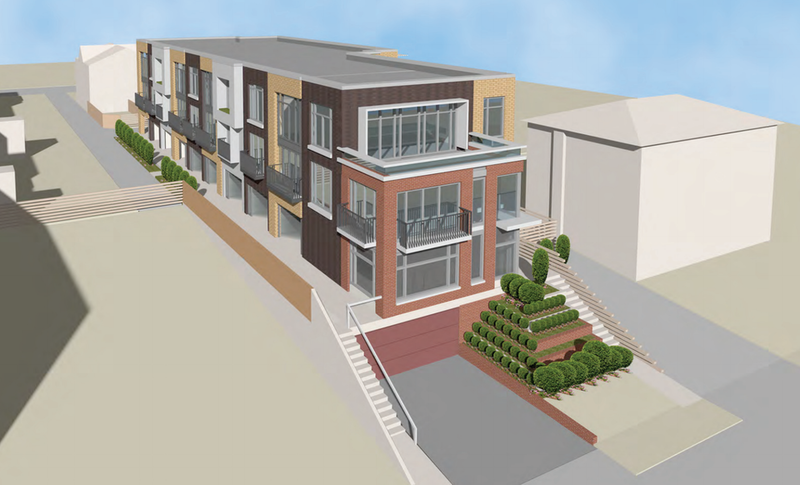 Known as Beltline Townhomes, the project would introduce 5 three-storey freehold homes to the area, 12.5 metres high. The latest resubmission is currently under review by City staff. Turning north onto Avenue Road, we continue a few hundred metres before reaching the Avenue Road and Eglinton intersection. Here, Avenue Crosstown Station will have two buildings; one at the intersection's northwest corner, and another on the north side of Eglinton, between Avenue and Oriole. Much of the work here is happening out of view of passersby, hidden by hoarding and largely below grade. Construction will continue throughout 2018, with the line due to open in 2021. 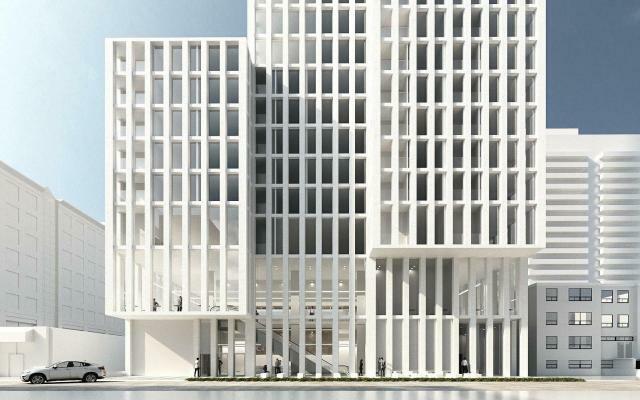 Immediately west of the station's main entrance at Avenue Road and Eglinton, Terranata Developments' plan for 346 Eglinton West has been appealed to the OMB. In conjunction with this appeal, a revised application was submitted in January 2018 which reduces the Rafael + Bigauskas Architects-designed proposal from 15 storeys to 10, and from 47.9 metres to 33.45. An OMB hearing to determine the next steps for the project is scheduled to commence on March 19th. Heading east along Eglinton, a Turner Fleischer Architects-designed proposal at 90 Eglinton West for Madison Homes was approved by Council last year, though the approval was appealed to the OMB by area residents in November 2017. The OMB file for the project has since been closed, meaning that we may see marketing for the 24-storey (negotiated down from 29) condominium tower begin this year. Adjacent to the east, on the northwest corner of Duplex and Eglinton, Madison Homes has another project on the table for 50-60 Eglinton West. An application was submitted in October 2017, seeking rezoning and OPA to permit a 36-storey condominium tower by Hariri Pontarini Architects and Turner Fleischer Architects. The project would preserve and modify an existing 1920-built Toronto Hydro substation on the site, and add 401 new homes above. The plan is currently under review by City staff. Immediately across Duplex to the east, another project planned for the intersection's northeast corner has remained dormant for quite some time. 36-44 Eglinton West's OMB case file has been closed since approval was granted for 39 storeys and a maximum of 320 units back in 2012. Shown simply in gray in the image above, the Adamson Associates-designed proposal has not been heard from since, though it could resurface in the near future. Turning north onto Duplex Avenue, we continue four blocks to Roselawn Avenue, which we follow east back to Yonge. Here, an almost full block of properties has been scooped up by developer Main and Main, who intend to bring a high-rise residential development to the site. The 2444 Yonge Street site includes the footprint of a 110-year-old Bank of Montreal building, which was controversially demolished in early 2017. A submission for OPA and ZBA followed later in the year, calling for a pair of architectsAlliance-designed towers of 25 and 27 storeys. The plan has been refused by City and since appealed to OMB, though no hearings have yet been scheduled. A block to the south on Yonge Street, construction of Rockport Group's Montgomery Square has topped out on the short block between Montgomery and Helendale Avenues. Cladding installation is now enclosing the 27-storey luxury rental tower designed by RAW, which rises above the preserved exterior of the heritage Postal Station K. Construction of the 233-unit residential tower is expected to continue well into late 2018, and possibly into the new year. It was recently announced that a Terroni restaurant and Cumbrae's butcher shop will move into the base. In the next block to the south, Lifetime Developments and Knightstone Capital's Whitehaus Condominiums got underway in 2017 with the start of shoring activity for the 29-storey Diamond Schmitt Architects-designed tower. The latest photos of the site, captured at the end of January, show that excavation of the project's five-level underground garage is in progress. Construction for Whitehaus will continue through 2018 and on into next year. Southeast of the Whitehaus site, the Yonge and Eglinton intersection has a new tallest structure. Construction of Bazis, Metropia, and RioCan's E Condos progressed significantly in 2017, and the Rosario Varacalli-designed mixed-use development's 38 and 58-storey towers now rise high into the local skylne. The taller south tower at the northeast corner of Yonge and Eglinton is now Toronto's tallest building north of the Four Seasons in Yorkville, and is now close to reaching its full 196-metre height. Both the south tower on Eglinton and the north tower along Roehampton Avenue will top out at their final heights this year, with construction to continue inside. The intersection of Yonge and Eglinton is curly a huge mess of reduced and detoured lanes. To the southwest, the demolition of the former Eglinton Subway Station bus terminal in 2017 has allowed the site to stage construction work for the main entrance and station box of Eglinton Crosstown Station. Work on the station's various elements will continue until the line's 2021 opening. On the southeast corner of Yonge and Eglinton is currently an eight-storey office building, planned for redevelopment by Davpart. 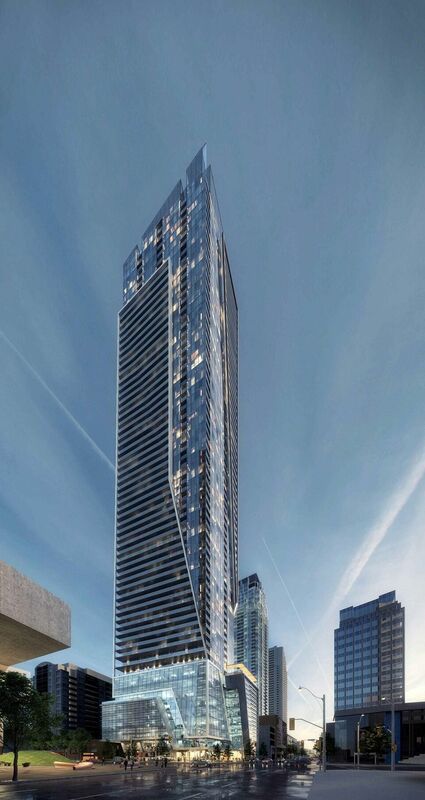 A 65-storey plan by Hariri Pontarini Architects for 1 Eglinton East was approved last year, granting a 211-metre height that would become Midtown Toronto's new tallest building if built as planned. With approvals in place, we expect to learn more about this project as the year progresses. Two properties south of the 1 Eglinton East site, construction is well underway on another tall building set to add a major presence to the neighbourhood skyline. Shoring and excavation for Tower Hill Development's 2221 Yonge Condos wrapped up last year, and below-grade forming has since begun for the 56-storey condo tower designed by New York-based Pei Partnership Architects working with local firm Quadrangle. Forming for the underground levels will progress over the next few months before work begins on the ground floor later in the year. South of the 2221 site, we pass the Minto Midtown development which set a new precedent for height in the area a decade ago, and continue to the south end of the block at Soudan. Here, another high-rise development was proposed in 2017. A June application from Tribute Communities seeks ZBA and SPA for 2161 Yonge Street. It would see a 36-storey mixed-use development by Graziani + Corazza Architects, containing condos, office, and retail space. The proposal has since been appealed to the OMB, though no meetings have yet been scheduled. At the southeast corner of Soudan and Eglinton, Art Shoppe Condos by Freed Developments and Capital Developments has started to rise above Yonge Street. The architectsAlliance-designed project will bring 12 and 28-storey towers to the area, rising from a shared podium. Construction on the project will continue throughout 2018 and into next year. 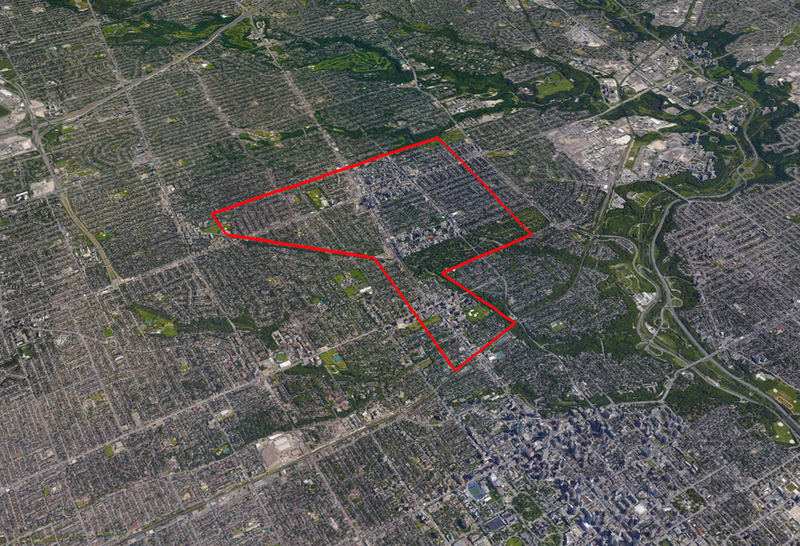 Upon completion, the project will introduce another 623 homes to the neighbourhood. A few dozen metres to the southwest, a mid-rise condominium development is in the works to replace an auto service centre at Yonge and Hillsdale. A plan for the site was approved by Council in 2015 at 9 storeys, though this plan was eventually pulled from the City's planning website. A new proposal was submitted in late 2017, and marketing for the building—now at 11-storeys—has begun. Dubbed Uovo Boutique Residences, ('uovo' is Italian for 'egg'), the project from The Sher Corporation, designed by RAW, aims to add 67 condominium units to the area. Roughly 300 metres to the south, a 2016 proposal for 1984 Yonge continues to works its way through the planning and approvals process, most recently with an October 2017 resubmission for ZBA. The plan from a numbered company seeks approvals for an eight-storey, 30-unit condominium development designed by Giovanni A. Tassone Architects to replace a pair of two-storey buildings. Across Yonge Street on the east side, Mattamy Homes and the Biddington Group are gearing up for the construction of their J. Davis House development at 1985 Yonge. The most recent photos captured at the site of the 9-storey Graziani + Corazza Architects-designed condo development show that demolition of existing buildings was in full swing as of December 2017. Construction of the new mid-rise development will proceed throughout 2018. Just south of the J. Davis House site, an assembly of properties at 1951 Yonge owned by Times Group Corporation was the subject of a March 2017 application seeking OPA and ZBA to permit 25 and 34-storey residential towers designed by Core Architects. Wrapping around the heritage 1894-built Davisville General Store and Post Office building, the project aims to introduce 450 residential units plus a new on-site park to the property. Toronto and East York Community Council have directed City Planning not to bring forward a Final Report for the project until the completion of an ongoing study called Midtown in Focus: Growth, Built Form and Infrastructure Review. A couple hundred metres south of the 1951 Yonge site and just south of Davisville, we turn east onto Balliol Street. Just east of Yonge on the north side of the street, a redevelopment is in the works for the Sobeys Urban Fresh supermarket. Here, Shiplake submitted a proposal in 2016 for a 38-storey purpose-built rental tower designed by gh3. 22 Balliol Residences is proposed to contain 425 rental apartments and a replacement supermarket in its base. The application has been appealed to the OMB, though no hearing dates have been posted yet. Further east, an August 2017 application at 265 Balliol seeks a ZBA to intensify a Tower-in-the-Park style apartment tower site owned by Park Property Management. The Quadrangle-designed purpose-built rental tower would reach 29 storeys tall, and introduce 264 new units to the Davisville community. There has been no news regarding the application since its submission, so we will keep our eyes peeled for new information. Returning to Yonge, we head south several blocks, passing Mount Pleasant Cemetery. Just north of the Yonge and St. Clair intersection, a pair of proposals have been dormant for quite a while. 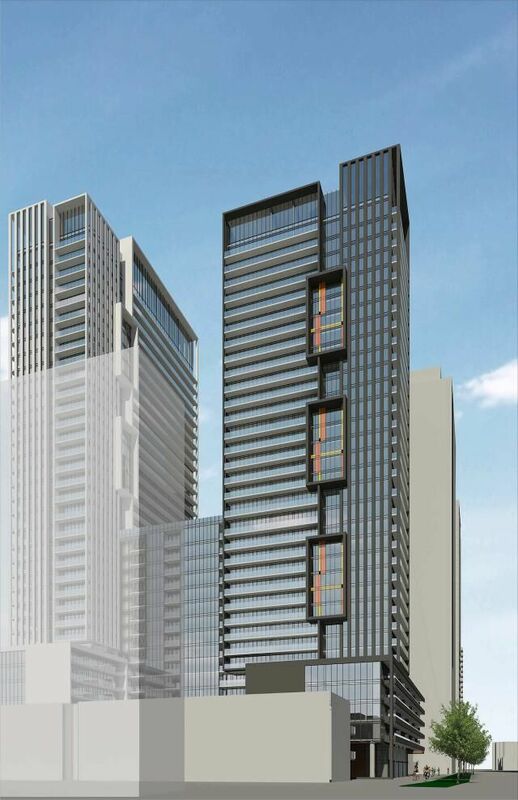 These include a 13-storey rental building proposed at 7 Heath Street East, and a 2009 OMB-approved proposal at 1481-1501 Yonge for three towers of 15, 16, and 37 storeys. The latter plan is in flux, as owner Wittington continues to expand their land assembly. Following a 2015 purchase, the plan now includes 1507 Yonge, which was previously the site of a standalone proposal for a 7-storey retail and office building proposed. The assembly has also since been expanded with the 2016 purchase of 1521 Yonge, and the 2018 purchase of 1525 Yonge. On the west side of Yonge Street, big news came early last year when it was announced that Chicago-based architects Studio Gang would be designing a new purpose-built rental tower for Slate Asset Management at the corner of Yonge and Delisle. No applications have yet been submitted to the City, though Studio Gang's portfolio of existing and planned projects indicates that whatever is proposed here will be quite the eye catcher. This is one of many projects in the area being led by Slate, part of the company's larger revitalization of the Yonge-St Clair area. Immediately south of the anticipated 1 Delisle proposal, Slate's 2 St. Clair West is undergoing renovations that will modify the tower's podium to create a better street presence at the northwest corner of Yonge and St. Clair. The changes will introduce a new Buca restaurant to the intersection, with design work by global architecture firm Gensler. Construction here is expected to wrap up soon, with a spring opening targeted for Buca. Across Yonge Street to the east, Slate's revitalization of 2 St. Clair East is just wrapping up. This complete renovation and re-merchandising of the 15-storey office tower's podium improves the complex pedestrian realm. All of the remaining finishing touches for the project—also designed by Gensler—should be in place shortly. To the immediate south, another retrofit by Gensler is in the works for the Scotiabank building at 1 St. Clair East. South of St Clair, a proposal from Terracap and Great Gulf at 1421 Yonge Street was approved by the OMB in 2017 following a few years of planning. Originally proposed at 42 storeys and rejected by City Council in 2015, the project was appealed to the province. Most recently, a 34-storey version of the project—now solely in the hands of Great Gulf and with a curvy new design by Hariri Pontarini Architects—was greenlit. The project is now listed in the "upcoming" section of Great Gulf's website, so we foresee marketing to commence shortly. One block south between Rosehill and Jackes Avenue, construction of The Jack Condos is progressing at the site of the former CHUM Building. The Quadrangle-designed project from Aspen Ridge Homes got its start in late 2016 when the CHUM building was demolished. In the roughly one and a half years since, shoring and excavation have been completed, and forming has since moved past the underground garage and on to the ground floor. Construction here will continue throughout 2018. Upon completion, The Jack will rise 11 storeys and contain 109 condominium units. Just east of Yonge Street and The Jack, we come to another Tower-in-the-Park site slated for intensification. In late 2016, bclMC and Bentall Kennedy submitted a proposalat 44 Jackes Avenue seeking ZBA and SPA to build a 29-storey rental building next to the site's existing 29-storey rental building. The Hariri Pontarini Architects-designed proposal known as the Rosehill Tower has been appealed to the OMB, with a hearing scheduled for May 2018. In the meantime, a revised plan was resubmitted to the City in February 2018, with a height of 102.64 metres and a reduced unit count of 251. Returning to Yonge Street, we continue southbound another few blocks before reaching the corner of Yonge and Shaftesbury. At the south side of the intersection, steps from Summerhill Station, tenants have begun to move into the re-clad and renovated 1133 Yonge Street. The project from Old Stonehenge Development Corporation appears complete when viewed from the north on Yonge, though work continues on the south side of the Studio JCI-designed project. Across the street to the southwest, we end this leg of our journey at 1190 Yonge Street, directly north of the CPR tracks at the corner of Birch Avenue. A 5-storey commercial development was proposed for this site in 2016 by Raffmarr Holdings, featuring a design by Detail Architect Inc., though no Planning Department reports (nor OMB appeals) have been released since the initial SPA submission. With a sliver of land to work with, and complicating factors like proximity to the rail corridor, it's anyone's guess whether or not we'll hear more about this project in 2018. Our next Growth to Watch For story will continue south into Yorkville, exploring development in the trendy rapidly-growing neighbourhood. In the meantime for more information , you can check out the database files, linked below, for any of the projects mentioned. You can tell us what you think of the developments happening in the city by joining the discussions in the associated Forum threads, or by leaving a comment in the space provided on this page! Proposed 44-storey condominium tower at 808 Mt. Pleasant Road in Toronto. The 457-unit development by Streetwise Capital Partners Inc. is designed by Sweeny &Co Architects Inc.
50 Broadway, Toronto | Frastell Property Management Inc.
50 Broadway is a 12-storey rental development from Frastell Property Management and Martin Simmons Architects. 117 Roselawn Avenue, Toronto | UrbanQuest Inc.
Uovo Boutique Residences is an 11-storey residential building located at 2112 Yonge Street at Hillsdale Avenue in Midtown Toronto, designed by RAW for The Sher Corporation. Site Plan and rezoning proposal for a mixed-use building: 9 storeys, retail on the ground floor, office on the second floor, and 30 residential rental units above. 7 Heath Street East condos in Toronto. 13 storey condo designed by &Co Architects. A 34-storey mixed-use building with 220 residential units designed by Hariri Pontarini for Terracap/Great Gulf.